You are here: Home / Our Animals / Chickens / What’s Owning Speckled Sussex Chickens Like? What’s Owning Speckled Sussex Chickens Like? Who doesn’t love a gorgeously feathered egg laying breed like Speckled Sussex chickens? Speckled Sussex chickens are so much fun to own! 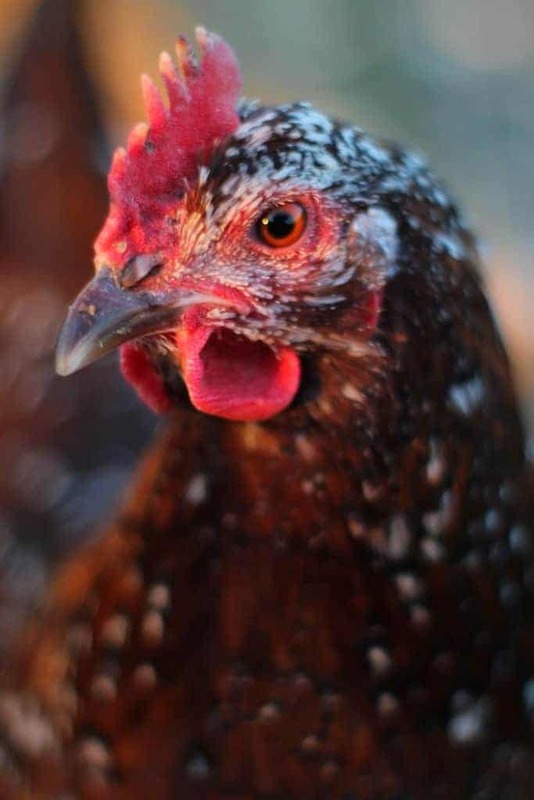 They have wonderful, inquisitive, and “big” personalities, not to mention the beautiful “speckles” on their feathers! Ours will willingly sit on our laps or take treats from our hands – they’re the perfect “pet” chicken! 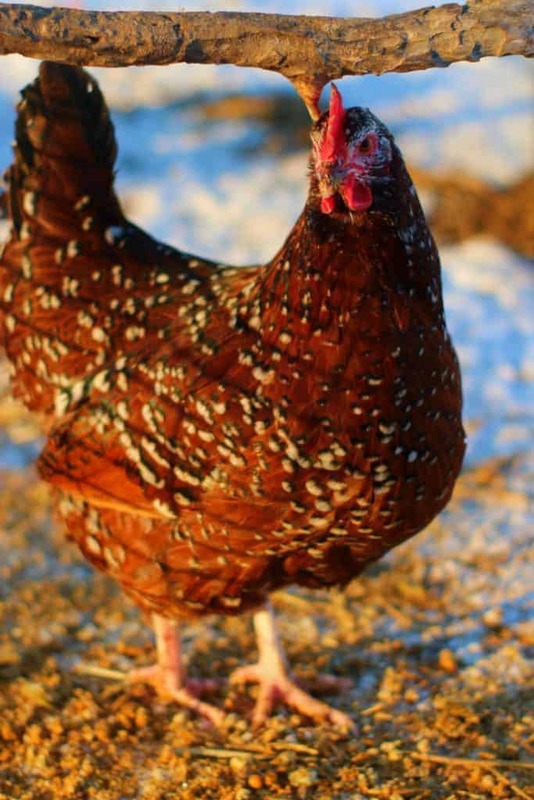 If you’ve been considering adding a Speckled Sussex hen or two to your coop, then read on to learn all about this wonderful breed! This breed of chickens, as it exists today, has been around since the mid-1800s, and originated in the county of Sussex, England, hence the name of the breed. While each color variety has its own individual influences, the Sussex chicken is largely influenced by Brahmas, Cochin, Dorking, among other breeds. Roosters can weigh up to 8 pounds while hens weigh about 6 pounds. While there are three different color varieties of the Sussex chicken that are recognized by the American Poultry Association, the speckled coloring is the oldest. Speckled Sussex hens have reddish brown feathers (which is referred to as mahogany) with black and white “speckling” which gives the breed its name. Each feather has a white tip, and the amount of speckles varies from chicken to chicken. The roosters can have green in their feathers as well! In Britain, 8 color varieties are recognized, including the Coronation Sussex, which was developed to celebrate the coronation of Edward VIII (who abdicated the British throne, and so the coronation never took place). Speckled Sussex hens lay about 260 light brown eggs per year, and are consistent layers. 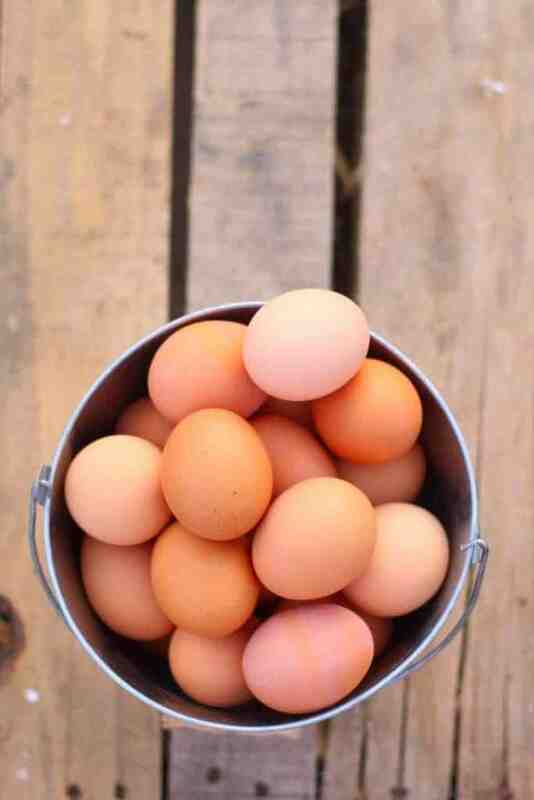 The size of the egg depends on the hen; ours lay medium-sized eggs. To ensure your Speckled Sussex hen lays healthy eggs, be sure to feed her a good layer feed and provide plenty of calcium supplements! You can also add herbs to her nesting box to help her feel comfortable laying. Speckled Sussex chickens are wonderful to own! They have “big” personalities, and ours are at the top of the flock. They’re curious, the first to check out new situations, love environmental enrichment, and are intelligent pets. Speckled Sussex chickens love attention, and love being at the center of action. If you add one to your flock, you’re sure to have hours of fun watching her interact with other chickens and beg you for treats! To ensure you have a pet chicken who enjoys human company, it’s important to handle them frequently when they’re chicks and spend a lot of time feeding them treats if you want lap chickens. They don’t require special feed, are docile, and the hens don’t get very aggressive during brooding. The roosters are equally a joy to be around! You can buy Speckled Sussex chickens at any major hatchery. They’re a very popular breed! 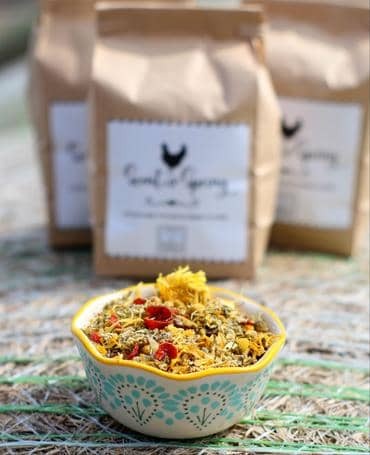 Cackle Hatchery is where we purchased ours, and they were healthy and happy when they arrived! 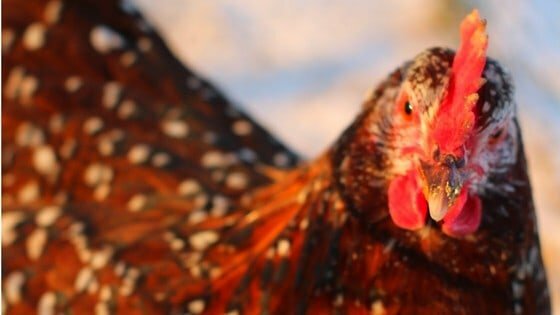 If you do go to a breeder, be sure to print out this article and take it with you so you can be sure the chicken you’re looking at is a Speckled Sussex! You are right about the breed sussex. Due to the fires in our area a feed yard was trying to find new homes for a couple of them. I took one to add to my urban yard. Dot, her name is so full of character! She’s a good hog! Loves larvae and follows me right to the door wanting more. Get one you’ll love the breed. My Suzy is one of my favorite birds! I’ve had her since the beginning of my chicken raising hobby. She is the first to run up and greet me when I go out to the run, and is ALWAYS first in line for treats. She will even jump up and try to knock the bag from my hand so she can get it faster. Love that girl! Our girl “Speckles” does the same thing. What beautiful hen’s! I require a breed that doesn’t have aggressive roosters because of my grandchildren. Would these qualify? I think the Speckled Sussex roosters are great. The personality does depend on the individual rooster though! We all love our Speckled Sussex who we call Speckles. Everything said in the article is right on the money. She was always the first chick to jump up on my hand when I would put it in the brooder and loved to just sit on my arm and get attention usually in the form of pets. While all my girls have personality, hers by far is the friendliest. When you go for the afternoon treat she will jump right up on your arm to say hello and get first shot at the scratch. If your arm is not accessible she will fly/climb up your back to get to your shoulder or head to see what is taking so long. We thought she was going to be the dominant hen in our flock based on her status in the brooder. She is probably more in the middle. We actually don’t seem to have an alpha female in our flock. We think this is because we have a drake in the mix with his two girls who are more dominant. You will not be disappointed with this breed.